Welcome to the Seaside Cottage!. It is a lovely cottage that has amazing views of the harbor, nearby islands and the open ocean from its decks. This is the ideal location for guests who require solitude and beauty. Honeymooners, painters, writers and photographers would do well here for inspiration from nature. The cottage has one bedroom that has a queen size bed. A futon in the living room sleeps two more people. The cottage is comfortable with a full kitchen that has everything you need entertain family and friends. Kayaks available for rent. The views are unbelievable from every room of the cottage, whether you are inside or out, in your bed or on the couch you can see the open ocean and nearby islands. Just relax and enjoy one of the most peaceful places around. Take a short walk down to Cat Cove for shell collecting and swimming. Cat Cove is an excellent site to launch your kayak for a tour around the harbor and islands close by. For those vacationers who need more adventures, there are many exciting things to do near West Point. Phippsburg has many wooded walking trails that are both easy to hike and pretty. Historic Popham Beach, settled in 1607, is a short distance down the road. The 500 acre beach is worth a visit for those who enjoy smooth, white sandy beaches. Popham Fort, from the Civil War years, is close by and ready to be explored. Sebasco Resort is also close by, and has a golf course, spa services and several restaurants. The nearest city to West Point is historic Bath, “The City of Ships”. Maine’s first ship was built here in 1607-1608. If you are interested in ships the Maine Maritime Museum offers a glimpse into Maine’s boat-building past. Maine’s boat-building future can be seen at the Bath Ironworks, where some of the most sophisticated Navy ships are built today. Small lovely cottage. Perfect for 2. Recommendations for future guests would be to pack extra towels and a blanket for cooler nights. Best to visit during season as well. Buy from local fisherman. Much better and cheaper than restaurants. Kitchen has everything you need to make perfect Maine lobster! WiFi was not working properly but owner was working on it. Very nice gentlemen and easy to deal with. All turned out fine in the end but a rough start. It was very disheartening to arrive in the dark and not be able to find the property easily ( could not find number on the house.) What was worse than that is when we called the property manager for hellp the number had been disconnected then when we called the owners number we where told he no longer owned it. We only had made these reservation 3 weeks before arriving why we weren’t sent updated info is beyond me. Not a positive first time experience with VRBO. Once we got into the property everything was fine. We loved all the new upgrades especially the dresser. Made staying more enjoyable as well as organized! Thanks for another great year. My wife and I spend a weekend in early September at this house. The views from the deck were spectacular and we very much enjoyed sitting out have our coffee. The house itself is small but definitely adequate for two people. As mentioned in a previous review finding the house was a little tricky since the car GPS did not bring us to the house itself. Beautiful view of a working harbor and islands. The cottage is perfect for a couple and is equipped with linens and basics. Close to large, sandy Popham Beach, Bath, and restaurants. Relaxing and peaceful. We had a wonderful week at this seaside cottage! 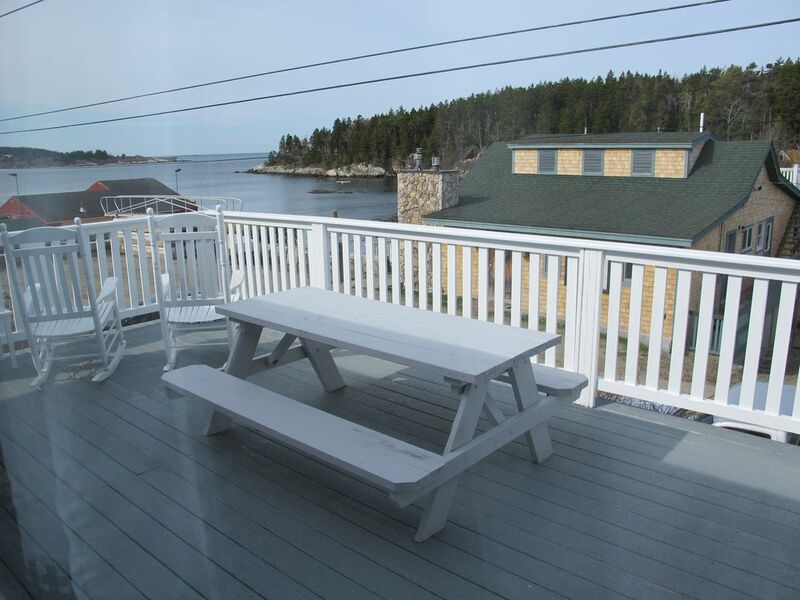 If you’re looking for a cozy, well equipped cottage with great views of the ocean and a working lobster harbor, you will love this place. A short walk away is Cat Cove where you can swim, hunt for shells, or watch the tides go in and out. Bill, the property manager was accommodating and a pleasure to deal with. All in all, a peaceful, restorative get away! Kayaks available for rent, single seats $100 per week, tandem seats $125 per week.